In DOS, Supply Chain Management (SCM) fully integrates the logistics and procurement function to ensure a seamless end-to-end process. The wider office of supply chain management includes the following functions: Logistics, Procurement, Enabling and Outreach, Aviation Safety, as well as Uniformed Capabilities. 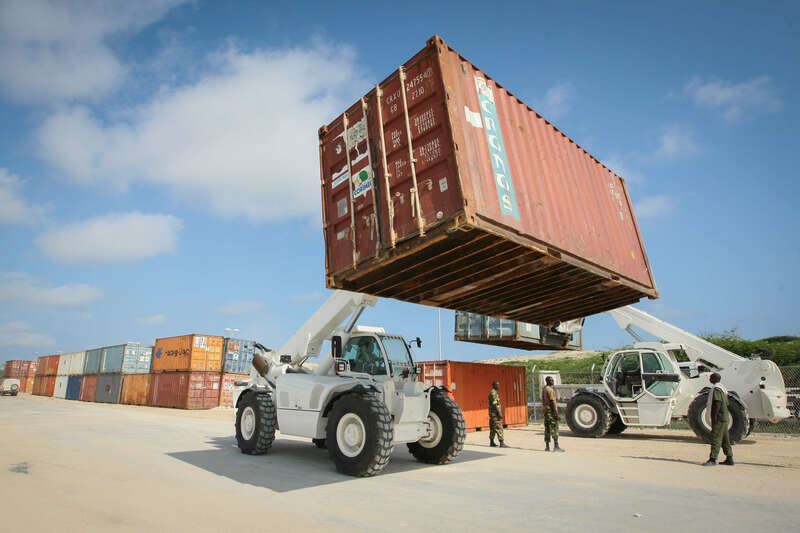 AMISOM/Ilyas AhmedContainers are prepared for shipment to the field. UN Field Support delivers everywhere the UN conducts peace operations. Our mission is to orchestrate a reliable, collaborative Supply Chain that our clients can trust. In this time of reform and change, we strive to improve our industry standards – including partner and client engagement – to cultivate smarter operations that link business processes, tangible measurements, and best practices in one unified structure. Client satisfaction and agile delivery is the heart of our focus, and this drives us to provide the most cost-effective goods and services to the entire Secretariat as well as Troop and Police Contributing Countries (T/PCCs). The recent merge of our Logistics and Procurement teams is incumbent to our Supply Chain success. This new internal restructure brings the values in our global strategic plans, robust category management approach, and new framework for Global Freight Forwarding to fruition. As one unit, our cost negotiations, purchasing, transportation planning and management, and global forecasting initiatives will operate with less red-tape, and staff will be given the freedom to focus on fulfilling demand and enhancing organizational responsiveness. Our Enabling and Outreach team will consistently monitor and measure the health of our supply chain so we can assess business gaps with precision, and apply innovative solutions to improve our overall performance. The Aviation Safety team is another link to our Supply Chain success; they will oversee the Organization’s aviation operations, including safety risk assessments, safety assurance activities, and technical clearance of aviation service vendors. A supply chain is often described as "a system of organizations, people, activities, information and resources involved in moving a good or service from the initial supplier to the final customer." Supply Chain Management is "the planning and management of all activities involved in sourcing and procurement, conversion, and all logistics management activities to meet the customer’s need" (Canadian Supply Chain Sector Council (www.supplychaincanada.org). It also includes coordination and collaboration with channel partners, including suppliers, intermediaries, third-party service providers and customers. Client demand: Fulfills UN mission requests for goods and services. Track & Trace: Monitors the status of requisitions, purchase orders, or shipments to follow progress and ensure completion. Demand Planning: Develops optimized plans for sourcing, logistics, storage, transport and distribution. Sourcing: Evaluates and secures the best suppliers for the Organization. Inbound Logistics: Organizes storage, transportation, and delivery of incoming goods from supplier to a distribution location. Storage and transport: Stores or prepare goods for transport according to relevant schedules. Outbound Logistics: Distributes goods and services to clients. Delivery and Receipt: Ensures clients receive the right goods, at the right time, at the best quality.